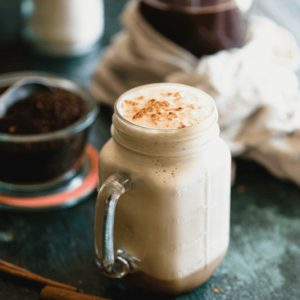 Protein Pumpkin Spice Coffee is like fall in a mug...it's protein-boosted, primal, paleo-friendly and has no added sugar. So easy to make! Combine the coffee, protein powder, and pumpkin pie spice in a blender. Blend on high for 15 seconds until it's frothy. *Click here for the brand I recommend.